Still only £13 giving you reduced rates at over a 1000 golf clubs. 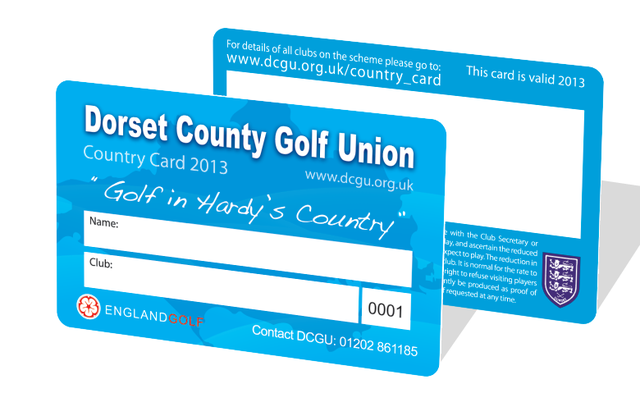 The Card will allow Dorset's golf club members to receive a green fee discount at the clubs involved guaranteeing you a great deal when using it. Please note the reduction in fees allowed is at the prerogative of the hosting club but in the main clubs try to ensure card holders get the best rate available to golfers at any time. The club has the right to refuse visiting players if the course is unavailable. Note: Weekends and Public Holidays are in the main excluded from the scheme. (Please check with the club) You are only allowed one visit to each club per year but again this is subject to the club. Members have to confirm with the club Secretary or Professional at least 72 hours in advance so as to ensure it is convenient to play as a Card holder on a particular day, and ascertain the reduced fee payable. You may be refused if you just turn up and expect to play. The card must be produced as proof of identity to obtain the concession. The cost of a card is only £13.00 + £0.95 p&p if ordering online. Membership is only available to Dorset golf club members. To order online click here. Only use this option if you are happy to pay via PayPal. Cards are valid for the calendar year only.